Make being stuck at your computer working a bit more enjoyable by dressing it up for the holiday. There are plenty of Christmas wallpapers or graphic, to add as desktop backgrounds. Below are some of my favorites–availabe for Windows 7, Vista and XP users. Remember to be careful when downloading anything from the internet. Downloads could contain spyware, adware or other types of malware. This is possible if you are downloading an executable file that should put decors on your desktop. 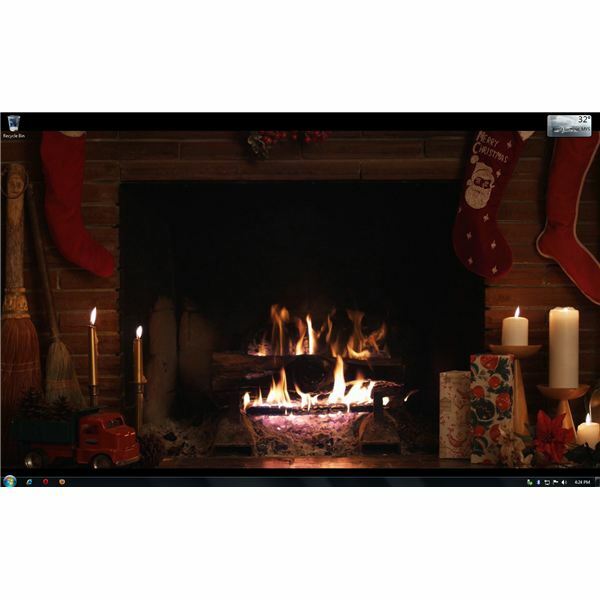 This is my favorite Christmas wallpaper because it has a warm Christmas spirit, thanks to the animated fireplace and candles with Christmas stockings. The smoke from the fireplace is also animated. However, it is not free to use. You need to have a registered license of DeskScapes from Stardock.com’s WinCustomize website. If you are using DeskScapes, you already know that there are thousands of wallpapers to choose from. This white Christmas wallpaper represents purity and can also describe pure love on Christmas! The image at the left is another neat Christmas holiday wallpaper to use. Reindeer and snow with Christmas tree in the wild? What more could you want? You can have this Christmas wallpaper for Windows 7, Vista or XP for free from https://www.wincustomize.com/explore/wallpapers/42682/. Simply save the compressed file on your desktop and extract the content. You’ll find 3 screen resolutions to use as your Christmas wallpaper: 1280×1024, 1600×1200 or 1920×1080. Decorate Your Desktop with an Animated Christmas Tree! 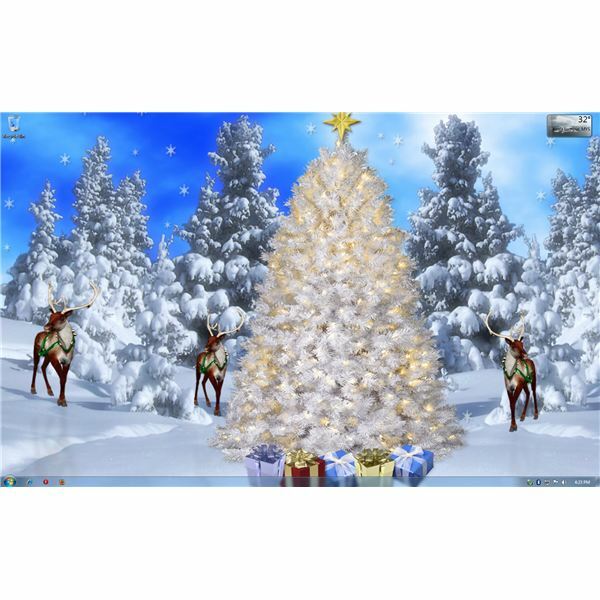 dress your Windows 7, Vista or XP OS with Christmas decorations. 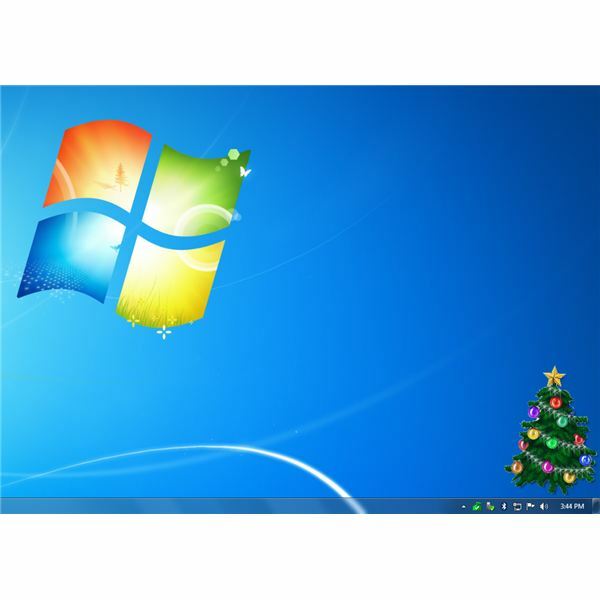 One example is an animated Christmas tree for Windows. The image at the left is an example of a Christmas tree that is actually animated when you install it on your computer. You can add more or several other types of Christmas trees if you wish. It’s available for free from https://get-xmas.com/. At the right, you’ll see the screenshot of Christmas trees decorating my Windows 7 desktop. Available options include adjusting the transparency, adding another tree, keeping it on top and automatically loading it during the Windows startup. Another option lets you drag it anywhere on your desktop to change the location of the Christmas tree. Windows Desktop Christmas Themes from Microsoft? There are some options for holiday wallpaper at the Microsoft website. I found two Christmas or holiday wallapapers to use for Windows 7 called Czech Winter and Twinkle Wish. Do some browsing to see what you can find!